Find a therapist in New York with GoodTherapy.org. The United States Census Bureau claims the state of New York was home to nearly 19.8 million people in 2015. Roughly 70.1% of the New York population is white, 17.6% is black, 8.8% is Asian, and 1% is American Indian or Alaskan Native. New York’s population is 51.4% female. Data acquired from the Bureau of Labor Statistics (BLS) indicates 168,080 residents were employed in jobs that specialized in social service or community welfare. Some of these jobs include working as a therapist, clinical social worker, guidance counselor, community health worker, parole officer, child psychologist, psychiatrist, religious worker, or a marriage and family therapist. In New York, workers in these fields were able to earn an average yearly wage of $50,850. Mental Health America (MHA) evaluates and compares mental health standards across all states in the U.S. and the District of Columbia each year. In the 2016 MHA report, the state of New York received an overall rank of 10th for statewide mental health conditions and practices. The survey’s authors from MHA suggest this high overall ranking is influenced by low rates of obesity in the state. New York placed 9th in adult ranking, 13th in youth ranking, 10th in prevalence of adverse mental health conditions, and 15th in access to mental health care. According to Mental Health America, approximately 2.8 million residents in New York are experiencing mental, emotional, and behavioral issues. The state has the seventh-lowest percentage of adults with addiction to drugs or alcohol, and the seventh-lowest percentage of adults with serious thoughts of suicide. Roughly 17% of adults with mental health issues who seek treatment report that their needs were not met due to socioeconomic barriers. Of all adults with mental health issues, 10.3% are currently uninsured, while 61.4% do not receive mental health services at all. 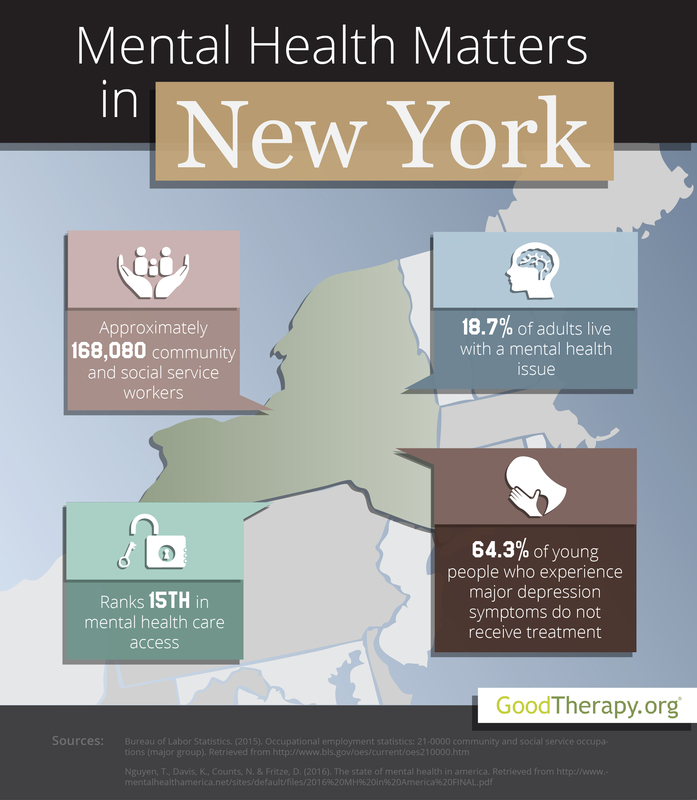 Young people in New York are also affected by adverse mental and behavioral health conditions. The 2016 MHA survey reveals close to 84,000 adolescents in the state are currently experiencing severe depression symptoms. Additionally, about 54,000 children in New York have private insurance which do not cover emotional or mental issues. While there may be challenges in obtaining mental health services, residents with mental health issues are still urged to find a therapist. In New York, the ratio of residents to mental health providers is estimated to be 443:1.